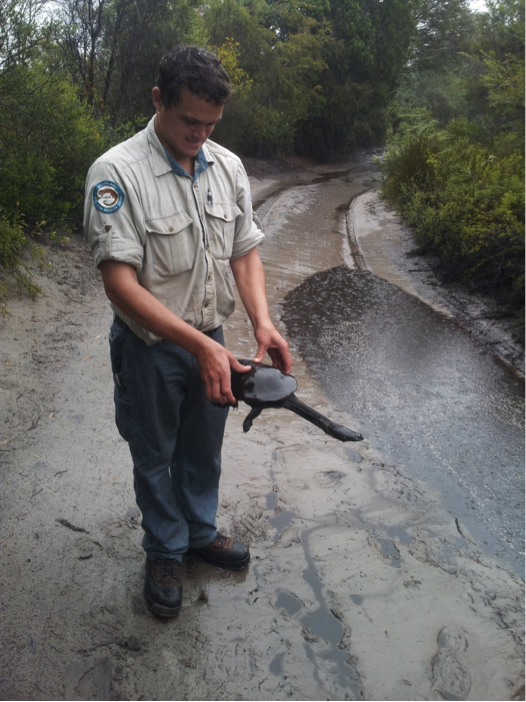 Local ranger Michael Nothling holding a Broad-shelled River Turtle Chelodina expansa at Bumeira (Brown Lake). This turtle is rarely seen as it mostly lives lying concealed at the bottom of the lakes. Only spotted when the females come out on land to nest over. Foxes on North Stradbroke Island are still thriving with an estimated population of between 1 and 2000. Recent wildfires only increased the opportunities for these sly and opportunistic predators to attack and eat small native animals left vulnerable with essential vegetation cover incinerated. The eradication program should have been geared up immediately to give native animals the best chance of survival but reaching an agreement of island landholders to a start-up of an island wide action program has been slow. The Redland City Council has, as FOSI members are aware, employed a controller doing good work for some years, but only on council land. The Queensland National Parks Service and QYAC joined this program and enabled eradication work on their lands early in 2014 but only recently has major landholder Sibelco allowed extension of fox control activities on their mining leases (after decades of mining company inaction in fulfilling their legal obligations to control feral animals on their leases thus allowing fox numbers to explode). Nevertheless progress is now being made. Michael Dickenson, the professional fox catcher, now puts the figure of eradicated foxes at 182, another 32 this year. It is worth comparing the experiences of fox control programs on Phillip Island, Victorian home to a single remaining penguin colony, the many other colonies having been decimated by foxes. On an island one third the size of Straddie with an estimated 200 foxes, the program started in the 1980’s and geared up in 2006 when a concerted effort of hunting, baiting and trapping at a cost of $160 000 per year eventually brought numbers down to an estimated 11 foxes. But foxes could repopulate even from this low level unless control continues. On Phillip Island foxes brought the penguin population to the brink of survival and the valuable eco-tourism trade with it. On Stradbroke foxes are threatening a wide variety of animals, many listed as vulnerable or endangered. We all know the nests of sea turtles are being raided by foxes, but the long necked turtles nesting in the banks of the island lakes are also under attack. The rare acid frogs of the island’s wetland environments are on the menu for foxes as are the nests of ground dwelling shorebirds including the rare beach stone curlew. Vulnerable baby koalas and wallabies, the rare water mouse and other small mammals are also easy targets. Stopping foxes is essential to maintaining the island’s biodiversity which in turn is an essential part of the island’s eco- tourism industry. FOSI will continue to monitor and lobby for increased and coordinated fox control measures and the commitment of a considerable annual budget by all landholders for many years to come. The $160 000 annual expenditure on Phillip Island is a fraction of the money needed here and now on Stradbroke to deal with a ten-fold fox population on an island 3 times the area. But foxes can be stopped within the confines of an island and this should be a priority for all landholders and a big concern for all Straddie lovers.